Cook pancakes from scratch inside this interactive recipe book — readers whisk the eggs, flip the pancakes, and more! 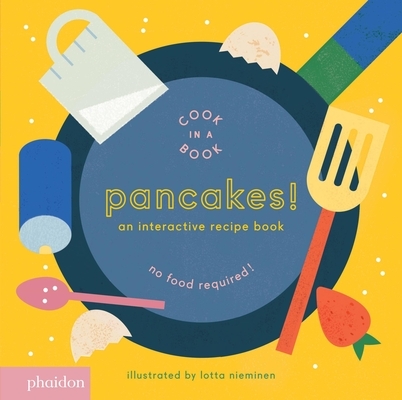 Simple, straightforward recipe text brings readers through each step of cooking pancakes, while the interactive novelty features, such as pull-tabs, wheels, and a punch-out piece, invite them to participate in the process. Cooking pancakes has never been so satisfying nor so clean! Perfect for young chefs-to-be, or any kid who prefers to 'do it myself'. This is the first title in a series of interactive recipe books. Lotta Nieminen is an illustrator, graphic designer, and art director from Helsinki, Finland, now running her own New York-based studio. In 2014, she was nominated for Forbes magazine?s annual 30 Under 30 list. In 2010, she received the Art Directors Club Young Guns award in the Art & Style category. This is her first novelty book for young children.